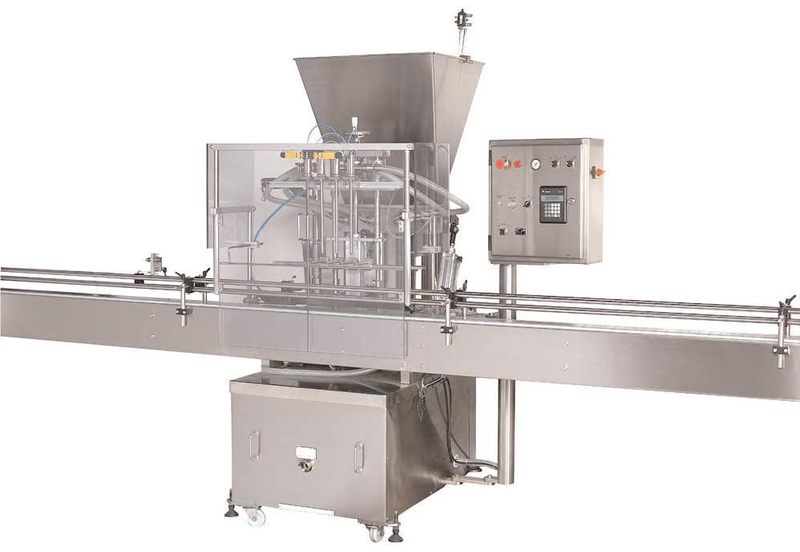 The Series 1500 Volumetric Piston Liquid Filling Systems are designed for completely automatic, multiple position, in-line dispensing of liquids and pastes in volumes ranging from 500 millilitres to 4 litres per cycle. Available in 2, 4, 6, or 8 nozzle configurations to match specific production requirements. Dual lane option available to increase production by 100% while preserving valuable line space. Precision bored, heavy-walled metering cylinders dispense product at accuracies up to +/- 0.25%. All product contact parts are constructed of stainless steel or food grade plastics for sanitary operations or use with corrosive materials. Available with motorized conveyor and indexing package for integrated container handling and positioning. No container/no fill feature detects missing or mispositioned containers to prevent waste and product spillage. Unique variable, separate speed control and actuator of a dual-stage fill provides precise "no spill" control for top-off applications or filling difficult products. Versatile Programmable Logic Controller (PLC) ensures reliable, repeatable control with minimal operator intervention. Available as a twin head (Model 1525) or in multiple heads (Model 1545, 1565, 1585). Volume range of 50ml to 5000ml with 6 metering cylinder options. PLC Control of pneumatic components with container sensor initiation. Dual stage filling for larger fills. Product supply to filler via 50 and 80 litre hoppers or with a suction hose. Rotary valves with large capacity ports and a check valve option for thin liquids. Wide range of non-drip shut off nozzles available with various outlets. Secondary fill speed feature for slower filling of long necked containers. Star wheel gating for indexing glass bottles, reducing shock, noise and chipping. Micro adjuster to provide individual adjustment to each metering cylinder.